AEG’s built-in 7000 washer dryer integrates with other appliances, runs quietly and provides total care for delicate fabrics. DualSense tailors the temperature and motion of the drum to each load, washing and drying them in one cycle. Minimising the need for dry-cleaning and handwashing. DualSense technology automatically adjusts the cycle settings according to fabric types in the load. This means that clothing is washed and dried with exactly the right temperature and optimised drum movements. Every item retaining its size and shape. All in a single cycle. 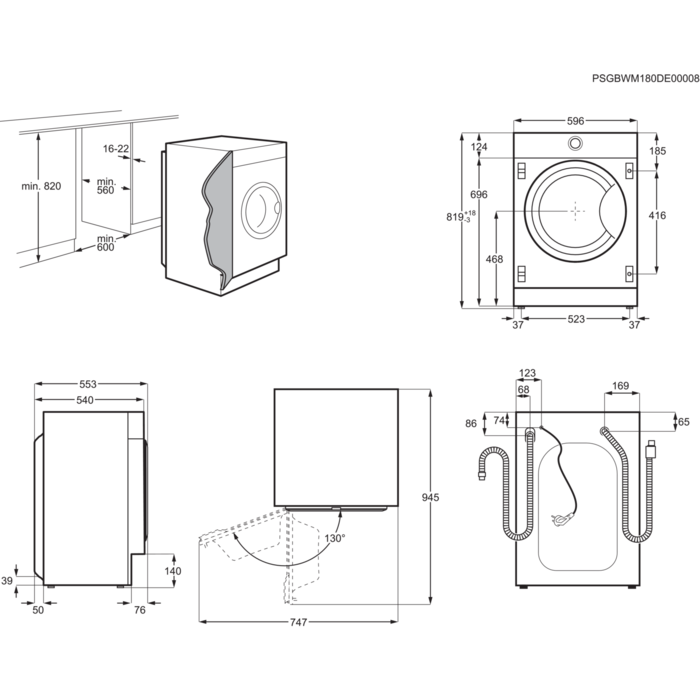 ProSense Technology® automatically adjusts washing and drying times according to the size of the load. This provides optimal care for clothing, while saving on time, energy and water. Ensuring the most efficient dry-to-dry process. The steam programme enables clothing to be refreshed without the need for a full cycle. By adding steam to the drum, fibres are relaxed and creases are reduced, minimising the need for ironing. And because this prevents garments from being overwashed, they look and feel better for longer. Have an outfit ready to wear in only one hour with the NonStop 60-Minute programme. It enables small loads to be washed and dried quickly in a single cycle. Providing absolute convenience with no compromise on care. The quiet washing machine ensures low noise levels when running a cycle. Minimising disruptions and maintaining a comfortable home. I was honestly amazed at how quiet this machine is, several times I have forgotten there was a load on while standing right next to it cooking. The drying is great too (but tends to wrinkle things quite a lot) The only downside I've found so far is that I'd prefer an active door release catch, but I suppose this one has fewer moving parts, so less need or repair. This machine is excellent. Well worth the money. The only slight problem is that the machine has to work out how long each individual wash will take according to the weight of the load. It starts off at 3 hrs and a short time later that can be down to 1 hr 30 mins so it can be difficult to be sure of the timing. However the results are great.